For all of my Facebook friends who are tired of the ALS Ice Bucket Challenge, please understand that what I’m about to say isn’t meant to be snarky—but get over it. He’s grateful to everyone who took the challenge. And he has more ice if you need it. multiple times each night to roll him in bed, I’m not the one who has struggled each and every time to do that turn myself, to shift a hip enough to make my body move. That’s all, just simply shift a hip. And even though I have to lift and drag his 200 pounds of dead weight across his transfer board to get him to his shower bench or to the sofa or to any seat outside his wheelchair, it’s him in that chair. He’s the one that is trapped. As close as I am to ALS, even I can’t really understand what it means to live inside that disease. Once he’s up for the day and has what he needs, most importantly the lifeline of his cell phone, I can walk away. And I do, for hours at a time some days as I grab the windshield time needed to serve my clients. I can walk away and he can’t, which leaves me outside the disease, looking in. And the view keeps changing. That’s one of the unrelenting evils of ALS, that it does its work so damn methodically. The Ice Bucket Challenge is supposed to be as much about education as it is about money, so here’s the short story of how the disease works: Something kills the spinal cord nerves feeding the voluntary muscles, and when the nerves die, so do the muscles. We don’t know what that destructive mechanism is, although smart scientists have made some very good guesses, but we can see the effects of the nerve degeneration on the body. Let me make that passive statement more personal. 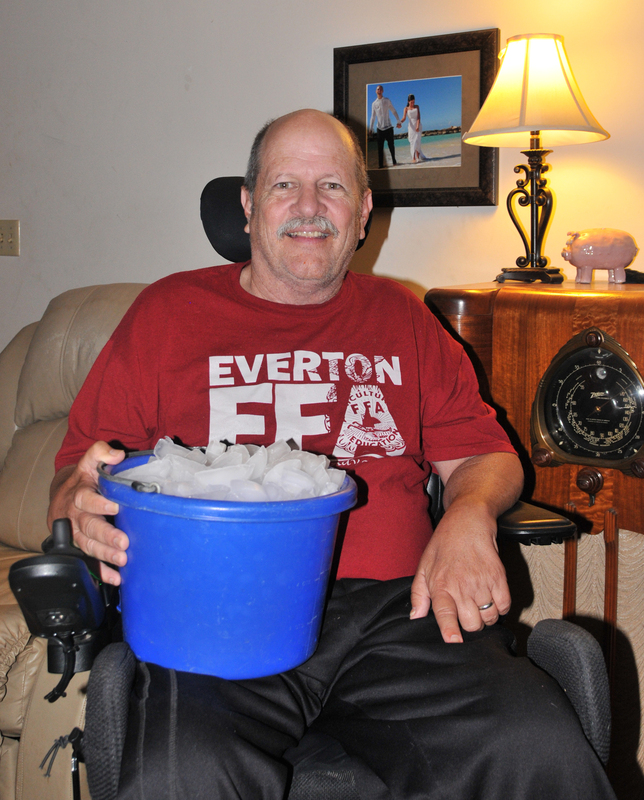 My husband’s ALS started with a prickly feeling in his legs. That was it three years ago, just that prickly feeling, some cramping and leg twitches, and a sense the floors were doing their best to trip him up. The twitches moved up to his abdomen. And now his arms. Three years ago he could walk unassisted, although he might lean on my shoulder if the ground was soft. Two years ago he started using a cane. A year ago he went to a wheelchair full-time. Truly something wicked this way comes and we know what will be affected next, but we try not to go there because today is manageable. Today is okay; why worry about tomorrow? Believe it or not, we’re the blessed ones in the ALS lottery. My husband’s disease started in his lower body, a stroke of questionable luck that probably added years to his prognosis. Many victims lose their voice first as the disease works its way down the body, and if you want to know how swiftly terrible ALS can be, try Bo Stern’s list of Empathic Experiences. Or be inspired by Rosemary Lambert, who bravely shares her ALS journey in the remarkable Live Simple, Love Like Crazy. I’ve never met you, Rosemary, but I love you anyway—have I told you that? I do. We were in the Yukon. Can you imagine how thrilling it is for me to so casually type those words? We were in the Yukon, a place where, according to poet Robert Service, surely the weak will perish, and every mile was leading us deeper into the wild. Mountains lay ahead, with thunderclouds hanging low above the peaks, and as we climbed toward Summit Lake Pass the clouds played games with the sun, parting only long enough to let a shaft of light fill the valley below. Good asphalt turned to gravel just before the pass and after a mile of that bumpy road, a lady in a road crew vest waved us to a stop. It’ll be a good long wait, she warned us. A few cars piled up behind our van as we chatted with the woman. She was from somewhere far south but she liked her work, she said, and we could tell it was true because she bubbled with the sheer joy of holding a stop sign on a dusty Yukon road. 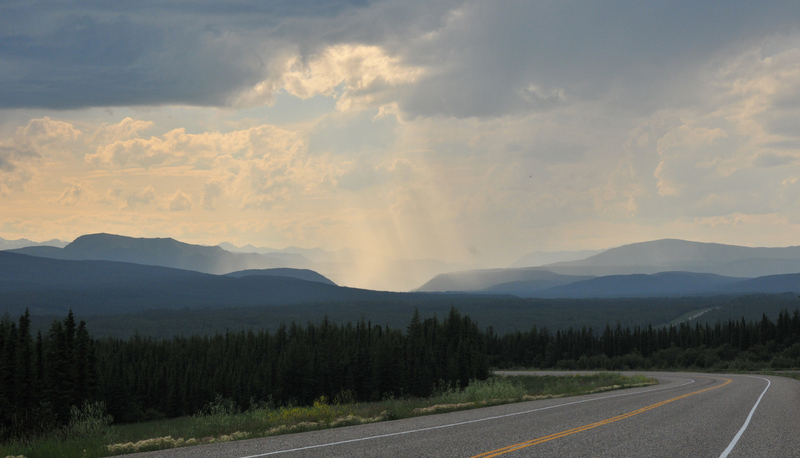 The clouds let loose while we were talking to her, big drops at first and then the hail, a torrent of it pounding down. Get in our van, I said, but she had her hard hat and her job to do. It kept hailing. I can hold the stop sign from my window, I said—get out of the rain. With the ice falling all around her, bouncing on what was gravel and turning the rest to mud, our road crew lady just grinned an impish grin, held her hands up to the hail, and she danced. That’s the Ice Challenge I want to remember from this summer—our dancing imp in the Yukon storm. Bless you all for raising money for ALS; the last total I heard was more than $53 million and that kind of money can resurrect promising studies which had been killed for lack of funds. But bless you even more for caring, because research and education is only a tiny part of an ALS family’s life, at least until a cure is found. The rest of the time it’s the love that matters. Here’s to another $53 million raised for ALS research. And here’s to the spirit that keeps one smiling even as the ice rains down.